Did that Divine Knowledge which constituted the supreme possession of the pagan priestcrafts survive the destruction of their temples? Is it yet accessible to mankind, or does it lie buried beneath the rubbish of ages, entombed within the very sanctuaries that were once illuminated by its splendor? "In Egypt," writes Origen, "the philosophers have a sublime and secret knowledge respecting the Nature of God. What did Julian imply when he spoke of the secret initiations into the sacred Mysteries of the Seven-Rayed God who lifted souls to salvation through His own nature? Who were the blessed theurgists who understood them profundities concerning which Julian dared not speak? If this inner doctrine were always concealed from the masses, for whom a simpler code had been devised, is it not highly probable that the exponents of every aspect of modern civilization - philosophic, ethical, religious, and scientific - are ignorant of the true meaning of the very theories and tenets on which their beliefs are founded? Do the arts and sciences that the race has inherited from older nations conceal beneath their fair exterior a mystery so great that only the most illumined intellect can grasp its import? Such is undoubtedly the case. Albert Pike, who has gathered ample evidence of the excellence of the doctrines promulgated by the Mysteries, supports his assertions by quoting from the writings of Clement of Alexandria, Plato, Epictetus, Proclus, Aristophanes, and Cicero, all of whom unite in lauding the high ideals of these institutions. From the unqualified testimony of such reputable authorities no reasonable doubt can exist that the initiates of Greece, Egypt, and other ancient countries possessed the correct solution to those great cultural, intellectual, moral, and social problems which in an unsolved state confront the humanity of the twentieth century. The reader must not interpret this statement to mean that antiquity had foreseen and analyzed every complexity of this generation, but rather that the Mysteries had evolved a method whereby the mind was so trained in the fundamental verities of life that it was able to cope intelligently with any emergency which might arise. Thus the reasoning faculties were organized by a simple process of mental culture, for it was asserted that where reason reigns supreme, inconsistency cannot exist. Wisdom, it was maintained, lifts man to the condition of Godhood, a fact which explains the enigmatical statement that the Mysteries transformed "roaring beasts into divinities." The preeminence of any philosophical system can be determined only by the excellence of its products. The Mysteries have demonstrated the superiority of their culture by giving to the world minds of such overwhelming greatness, souls of such beatific vision, and lives of such outstanding impeccability that even after the lapse of ages the teachings of these individuals constitute the present spiritual, intellectual, and ethical standards of the race. The initiates of the various Mystery schools of past ages form a veritable golden chain of supermen and superwomen connecting heaven and earth. They are the links of that Homeric "golden chain" with which Zeus boasted he could bind the several parts of the universe to the pinnacle of Olympus. The sons and daughters of Isis are indeed an illustrious line - founders of sciences and philosophies, patrons of arts and crafts, supporting by the transcendency of their Divinely given power the structures of world religions erected to do them homage. Founders of doctrines which have molded the lives of uncounted generations, these Initiate-Teachers bear witness to that spiritual culture which has always existed - and always will exist - as a divine institution in the world of men. Those who represent an ideal beyond the comprehension of the masses must face the persecution of the unthinking multitude who are without that Divine idealism which inspires progress and those rational faculties which unerringly sift truth from falsehood. The lot of the Initiate-Teacher is therefore almost invariably an unhappy one. Pythagoras, crucified and his university burned; Hypatia, torn from her chariot and rended limb from limb; Jacques de Molay, whose memory survives the consuming flame; Savonarola, burned in the square of Florence; Galileo, forced to recant upon bended knee; Giordano Bruno, burned by the Inquisition; Roger Bacon, compelled to carry on his experiments in the secrecy of his cell and leave his knowledge hidden under cipher; Dante Alighieri, dying in exile from his beloved city; Francis Bacon, patient. under the burden of persecution; Cagliostro, the most vilified man of modern times - all this illustrious line bear unending witness of man's inhumanity to man. The world has ever been prone to heap plaudits upon its fools and calumny upon its thinkers. Here and there notable exceptions occur, as in the case of the Comte de St.-Germain, a philosopher who survived his inquisitors and through the sheer transcendency of his genius won a position of comparative immunity. But even the illustrious Comte - whose illumined intellect merited the homage of the world - could not escape being branded an impostor, a charlatan, and an adventurer. From this long fist of immortal men and women who have represented the Ancient Wisdom before the world, three have been chosen as outstanding examples for more detailed consideration: the first the most eminent woman philosopher of all ages; the second the most maligned and persecuted man since the beginning of Christian Era; the third the most brilliant and the most successful modern exponent of this Ancient Wisdom. Sitting in the chair of philosophy previously occupied by her father, Theon the mathematician, the immortal Hypatia was for many years the central figure in the Alexandrian School of Neo-Platonism. Famed alike for the depth of her learning and the charm of her person, beloved by the citizens of Alexandria, and frequently consulted by the magistrates of that city, this noble woman stands out from the pages of history as the greatest of the pagan martyrs. A personal disciple of the magician Plutarch, and versed in the profundities of the Platonic School, Hypatia eclipsed in argument and public esteem every proponent of the Christian doctrines in Northern Egypt. While her writings perished at the time of the burning of the library of Alexandria by the Mohammedans, some hint of their nature may be gleaned from the statements of contemporaneous authors. Hypatia evidently wrote a commentary on the Arithmetic of Diophantus, another on the Astronomical Canon of Ptolemy, and a third on the Conics of Apollonius of Perga. Synesius, Bishop of Ptolemais, her devoted friend, wrote to Hypatia for assistance in the construction of an astrolabe and a hydroscope. Recognizing the transcendency of her intellect, the learned of many nations flocked to the academy where she lectured. From Vænius' Theatro Moral de la Vida Humana. There is legend to the effect that the Tablet of Cebes, a dialogue between Cebes and Gerundio, was based upon an ancient table set up in the Temple of Kronos at Athens or Thebes which depicted the entire progress of human life. The author of the Tablet of Cebes was a disciple of Socrates, and lived about 390 B.C. The world is represented as a great mountain. Out of the earth at the base of it come he myriads of human creatures who climb upward in search of truth and immortality. Above the clouds which conceal the summit of the mountain is the goal of human attainment - true happiness. The figures and groups are arranged as follows: (1) the door of the wall of life; (2) the Genius or Intelligence; (3) deceit (4) opinions, desires, and pleasures; (5) fortune; (6) the strong; (7) venery, insatiability, flattery; (8) sorrow; (9) sadness; (10) misery; (11) grief, (12) rage or despair; (13) the house of misfortune; (14) penitence; (15) true opinion; (16) false opinion; (17) false doctrine; (18) poets, orators, geometers, et. al. ; (19) incontinence, sexual indulgence, and opinion; (20) the road of the true doctrine (21) continence and patience; (22) the true doctrine; (23) truth and persuasion; (24) science and the virtues; (25) happiness, (26) the highest (first) pleasure of the wise man; (27) the lazy and the strays. A number of writers have credited the teachings of Hypatia with being Christian in spirit; in fact she removed the veil of mystery in which the new cult had enshrouded itself, discoursing with such clarity upon its most involved principles that many newly converted to the Christian faith deserted it to become her disciples. Hypatia not only proved conclusively the pagan origin of the Christian faith but also exposed the purported miracles then advanced by the Christians as tokens of divine preference by demonstrating the natural laws controlling the phenomena. At this time Cyril - later to be renowned as the founder of the doctrine of the Christian Trinity and canonized for his zeal - was Bishop of Alexandria. Seeing in Hypatia a continual menace to the promulgation of the Christian faith, Cyril - indirectly at least - was the cause of her tragic end. Despite every later effort to exonerate him from the stigma of her murder, the incontrovertible fact remains that he made no effort to avert the foul and brutal crime. The only shred of excuse which might be offered in his defense is that, blinded by the spell of fanaticism, Cyril considered Hypatia to be a sorceress in league with the Devil. In contrast to the otherwise general excellence of the literary works of Charles Kingsley maybe noted his puerile delineation of character of Hypatia in his book by that name. Without exception, the meager historical references to this virgin philosopher attest her virtue, integrity, and absolute devotion to the principles of Truth and Right. While it is true that the best minds of the Christianity of that period may readily be absolved from the charge of participes criminis, the implacable hatred of Cyril unquestionably communicated itself to the more fanatical members of his faith, particularly to a group of monks from the Nitrian desert. Led by Peter the Reader, a savage and illiterate man, they attacked Hypatia on the open street as she was passing from the academy to her home. Dragging the defenseless woman from her chariot, they took her to the Cæsarean Church. Tearing away her garments, they pounded her to death with clubs, after which they scraped the flesh from her bones with oyster shells and carried the mutilated remains to a place called Cindron, where they burned them to ashes. Thus perished in A.D. 415 the greatest woman initiate of the ancient world, and with her fell also the Neo-Platonic School of Alexandria. The memory of Hypatia has probably been perpetuated in the hagiolatry of the Roman Catholic Church in the person of St. Catherine of Alexandria. The "divine" Cagliostro, one moment the idol of Paris, the next a lonely prisoner in a dungeon of the Inquisition, passed like a meteor across the face of France. According to his memoirs written by him during his confinement in the Bastille, Alessandro Cagliostro was born in Malta of a noble but unknown family. He was reared and educated in Arabia under the tutelage of Altotas, a man well versed in several branches of philosophy and science and also a master of the transcendental arts. While Cagliostro's biographers generally ridicule this account, they utterly fail to advance in its stead any logical solution for the source of his magnificent store of arcane knowledge. From Houdon's Bust of Cagliostro. The Comte di Cagliostro is described as a man not overly tall, but square shouldered and deep of chest. His head, which was large, was abundantly covered with black hair combed back from his broad and noble forehead. His eyes were black and very brilliant, and when he spoke with great feeling upon some profound subject the pupils dilated, his eyebrows rose, and he shook his head like a maned lion. His hands and feet were small - an indication of noble birth - and his whole bearing was one of dignity and studiousness. He was filled with energy, and could accomplish a prodigious amount of work. He dressed somewhat fantastically, gave so freely from an inexhaustible purse that he received the title of "Father of the Poor," accepted nothing from anyone, and maintained himself in magnificence in a combined temple and palace in the Rue d, la Sourdière. According to his own statement he was initiated into the Mysteries by none other than the Comte de St.-Germain. He had traveled through all parts of the world, and in the ruins of ancient Babylon and Nineveh had discovered wise men who understood all the secrets of human life. According to popular belief Cagliostro's real name was Giuseppe Balsamo, and he was a Sicilian by birth. Within recent years, however, doubts have arisen as to whether this belief is in accord with the facts. It may yet be proved that in part, at least, the tirades of abuse heaped upon the unfortunate Comte have been directed against the wrong man. Giuseppe Balsamo was born in 1743 of honest but humble parentage. From boyhood he exhibited selfish, worthless, and even criminal tendencies, and after a series of escapades disappeared. Trowbridge(loc. cit.) presents ample proof that Cagliostro was not Giuseppe Balsamo, thus disposing of the worst accusation against him. After six months' imprisonment in the Bastille, on his trial Cagliostro was exonerated from any implication in the theft of the famous "Queen's Necklace," and later the fact was established that he had actually warned Cardinal de Rohan of the intended crime. Despite the fact, however, that he was discharged as innocent by the French trial court, a deliberate effort to vilify Cagliostro was made by an artist - more talented than intelligent - who painted a picture showing him holding the fatal necklace in his hand. The trial of Cagliostro has been called the prologue of the French Revolution. The smoldering animosity against Marie Antoinette and Louis XVI engendered by this trial later burst forth as the holocaust of the Reign of Terror. In his brochure, Cagliostro and His Egyptian Rite of Freemasonry, Henry R. Evans also ably defends this much persecuted man against the infamies so unjustly linked with his name. Sincere investigators of the facts surrounding the life and mysterious "death" of Cagliostro are of the opinion that the stories circulated against him may be traced to the machinations of the Inquisition, which in this manner sought to justify his persecution. The basic charge against Cagliostro was that he had attempted to found a Masonic lodge in Rome - nothing more. All other accusations are of subsequent date. For some reason undisclosed, the Pope commuted Cagliostro's sentence of death to perpetual imprisonment. This act in itself showed the regard in which Cagliostro was held even by his enemies. While his death is believed to have occurred several years later in an Inquisitional dungeon in the castle of San Leo, it is highly improbable that such was the case. There are rumors that he escaped, and according to one very significant story Cagliostro fled to India, where his talents received the appreciation denied them in politics-ridden Europe. Later when arrested and sent to the Bastille, Cagliostro wrote on the wall of his cell the following cryptic message which, when interpreted, reads: "In 1789 the besieged Bastille will on July 14th be pulled down by you from top to bottom." 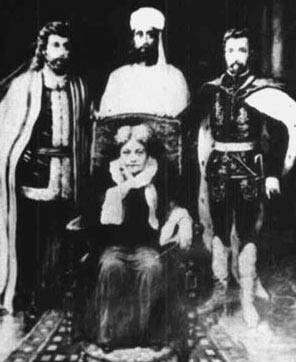 Cagliostro was the mysterious agent of the Knights Templars, the Rosicrucian initiate whose magnificent store of learning is attested by the profundity of the Egyptian Rite of Freemasonry. Thus Comte di Cagliostro remains one of the strangest characters in history - believed by his friends to have lived forever and to have taken part in the marriage feast of Cana, and accused by his enemies of being the Devil incarnate! His powers of prophecy are ably described by Alexandre Dumas in The Queen's Necklace. The world he sought to serve in his own	strange way received him not, but has followed with relentless persecution down through the centuries even the very memory of this illustrious adept who, unable to accomplish the great labor at hand, stepped aside in favor of his more successful compatriot, the Comte de St-Germain. During the early part of the eighteenth century there appeared in the diplomatic circles of Europe the most baffling personality of history - a man whose life was so near a synonym of mystery that the enigma of his true identity was as insolvable to his contemporaries as it has been to later investigators. The Comte de St.-Germain was recognized as the outstanding scholar and linguist of his day. His versatile accomplishments extended from chemistry and history to poetry and music. He played several musical instruments with great skill and among his numerous compositions was a short opera. He was also an artist of rare ability and the remarkably luminous effects which he created on canvas are believed to have been the result of his mixing powdered mother-of-pearl with his pigments. He gained worldwide distinction for his ability to reproduce in his paintings the original luster of the precious stones appearing upon the costumes of his subjects. His linguistic proficiency verged on the supernatural. He spoke German, English, Italian, Portuguese, Spanish, French with a Piedmontese accent, Greek, Latin, Sanskrit, Arabic, and Chinese with such fluency that in every land he visited he was accepted as a native. He was ambidextrous to such a degree that: he could write the same article with both hands simultaneously. When the two pieces of paper were afterwards placed together with a light behind them, the writing on one sheet exactly covered, letter for letter, the writing on the other. As a historian, the Comte de St.-Germain possessed uncanny knowledge of every occurrence of the preceding two thousand years, and in his reminiscences he described in intimate detail events of previous centuries in which he had played important rôles. He assisted Mesmer in developing the theory of mesmerism, and in all probability was the actual discoverer of that science. His knowledge of chemistry was so profound that he could remove flaws from diamonds and other precious stones - a feat which he actually performed at the request of Louis XV in 1757. He was also recognized as an art critic without a peer and was often consulted regarding paintings accredited to the great masters. His claim to the possession of the fabled elixir of life was home witness to by Madame de Pompadour, who discovered, she declared, that he had presented a lady of the court with a certain priceless liquid which had had the effect of preserving her youthful vivacity and beauty for over twenty-five years beyond the normal term. The startling accuracy of his prophetic utterances gained for him no small degree of fame. To Marie Antoinette he predicted the fall of the French monarchy, and he was also aware of the unhappy fate of the royal family years before the Revolution actually took place. The crowning evidence, however, of the Comte's genius was his penetrating grasp of the political situation of Europe and the consummate skill with which he parried the thrusts of his diplomatic adversaries. He was employed by a number of European governments, including the French, as a secret agent, and at all times bore credentials which gave him entrée to the most exclusive circles. In her excellent monograph, The Comte de St.-Germain, the Secret of Kings, Mrs. Cooper-Oakley lists the most important names under which this amazing person masqueraded between the years 1710 and 1822. "During this time," she writes, "we have M. de St.-Germain as the Marquis de Montferrat, Comte Bellamarre or Aymar at Venice, Chevalier Schoening at Pisa, Chevalier Weldon at Milan and Leipzig, Comte Soltikoff at Genoa and Leghorn, Graf Tzarogy at Schwalbach and Triesdorf, Prinz Ragoczy at Dresden, and Comte de St.-Germain at Paris, The Hague, London, and St. Petersburg." It is evident that M. de St.-Germain adopted these various names in the interests of the political secret service work which historians have presumed to be the major mission of his life. The Comte de St.-Germain has been described as of medium height, well proportioned in body, and of regular and pleasing features. His complexion was somewhat swarthy and his hair dark, though often shown powdered. He dressed simply, usually in black, but his clothes were well fitting and of the best quality. He had apparently a mania for diamonds, which he wore not only in rings but also in his watch and chain, his snuff box, and upon his buckles. A jeweler once estimated the value of his shoe buckles at 200,000 francs. The Comte is generally depicted as a man in middle life, entirely devoid of wrinkles and free from any physical infirmity. He ate no meat and drank no wine, in fact seldom dined in the presence of any second person. Although he was looked upon as a charlatan and impostor by a few nobles at the French court, Louis XV severely reprimanded a courtier who made a disparaging remark concerning him. The grace and dignity that characterized his conduct, together with his perfect control of every situation, attested the innate refinement and culture of one "to the manner born." This remarkable person also had the surprising and impressive ability to divine, even to the most minute details, the questions of his inquisitors before they were asked. By something akin to telepathy he was also able to feel when his presence was needed in some distant city or state, and it has even been recorded of him that he had the astonishing habit not only of appearing in his own apartment and in those of friends without resorting to the conventionality of the door but also of departing therefrom in a similar manner. The Comte de St.-Germain has been generally regarded as an important figure in early activities of the Freemasons. Repeated efforts, however, probably with an ulterior motive, have been made to discredit his Masonic affiliations. An example of this is the account appearing in The Secret Tradition in Freemasonry, by Arthur Edward Waite. This author, after making several rather disparaging remarks on the subject, amplifies his article by reproducing an engraving of the wrong Comte de St.-Germain, apparently being unable to distinguish between the great illuminist and the French general. It will yet be established beyond all doubt that the Comte de St.-Germain was both a Mason and a Templar; in fact the memoirs of Cagliostro contain a direct statement of his initiation into the order of the Knights Templars at the hands of St.-Germain. Many of the illustrious personages with whom the Comte de St.-Germain associated were high Masons, and sufficient memoranda have been preserved concerning the discussions which they held to prove that he was a master of Freemasonic lore. It is also reasonably certain that he was connected with the Rosicrucians - possibly having been the actual head of that order. The Comte de St.-Germain was thoroughly conversant with the principles of Oriental esotericism. He practiced the Eastern system of meditation and concentration, upon several occasions having been seen seated with his feet crossed and hands folded in the posture of a Hindu Buddha. He had a retreat in the heart of the Himalayas to which he retired periodically from the world. On one occasion he declared that he would remain in India for eighty-five years and then would return to the scene of his European labors. At various times he admitted that he was obeying the orders of a power higher and greater than himself. What he did not say was that this superior power was the Mystery school which had sent him into the world to accomplish a definite mission. The Comte de St.-Germain and Sir Francis Bacon are the two greatest emissaries sent into the world by the Secret Brotherhood in the last thousand years. E. Francis Udny, a Theosophical writer, is of the belief that the Comte de St.-Germain was not the son of Prince Rákóczy of Transylvania, but because of his age could have been none other than the prince himself, who was known to be of a deep philosophic and mystic nature. The same writer believes the Comte de St.-Germain passed through the "philosophic death" as Francis Bacon in 1626, as François Rákóczy in 1735, and as Comte de St.-Germain in 1784. He also feels that the Comte de St.-Germain was the famous Comte de Gabalis, and as Count Hompesch was the last Grand Master of the Knights of Malta. It is well known that many members of the European secret societies have feigned death for various purposes. Marshal Ney, a member of the Society of Unknown Philosophers, escaped the firing squad and under the name of Peter Stuart Ney lived and taught school for over thirty years in North Carolina. On his deathbed, P. S. Ney told Doctor Locke, the attending physician, that he was Marshal Ney of France. Many times the question has been asked, Was Francis Bacon's vision of the "New Atlantis" a prophetic dream of the great civilization which was so soon to rise upon the soil of the New World? It cannot be doubted that the secret societies of Europe conspired to establish upon the American continent "a new nation, conceived in liberty and dedicated to the proposition that all men are created equal." Two incidents in the early history of the United States evidence the influence of that silent body which has so long guided the destinies of peoples and religions. By them nations are created as vehicles for the promulgation of ideals, and while nations are true to these ideals they survive; when they vary from them they vanish like the Atlantis of old which had ceased to "know the gods." "Little seems to have been known concerning this old gentleman; and in the materials from which this account is compiled his name is not even once mentioned, for he is uniformly spoken of or referred to as 'the Professor.' He was evidently far beyond his threescore and ten years; and he often referred to historical events of more than a century previous just as if he had been a living witness of their occurrence; still he was erect, vigorous and active - hale, hearty, and clear-minded - as strong and energetic every way as in the prime of his life He was tall, of fine figure, perfectly easy, and very dignified in his manners; being at once courteous, gracious and commanding. He was, for those times and considering the customs of the Colonists, very peculiar in his method of living; for he ate no flesh, fowl or fish; he never used for food any 'green thing,' any roots or anything unripe; he drank no liquor, wine or ale; but confined his diet to cereals and their products, fruits that were ripened on the stem in the sun, nuts, mild tea and the sweets of honey, sugar or molasses. "He was well educated, highly cultivated, of extensive as well as varied information, and very studious. He spent considerable of his time in the patient and persistent conning of a number of very rare old books and ancient manuscripts which he seemed to be deciphering, translating or rewriting. These books and manuscripts, together with his own writings, he never showed to anyone; and he did not even mention them in his conversations with the family, except in the most casual way; and he always locked them up carefully in a large, old-fashioned, cubically shaped, iron-bound, heavy, oaken chest, whenever he left his room, even for his meals. He took long and frequent walks alone, sat on the brows of the neighboring hills, or mused in the midst of the green and flower-gemmed meadows. He was fairly liberal - but in no way lavish - in spending his money, with which he was well supplied. He was a quiet, though a very genial and very interesting, member of the family; and be was seemingly at home upon any and every topic coming up in conversation. He was, in short, one whom everyone would notice and respect, whom few would feel well acquainted with, and whom no one would presume to question concerning himself - as to whence he came, why he tarried, or whither he journeyed. " Did General Washington and Doctor Franklin recognize the Professor as an emissary of the Mystery school which has so long controlled the political destinies of this planet? Benjamin Franklin was a philosopher and a Freemason - possibly a Rosicrucian initiate. He and the Marquis de Lafayette - also a man of mystery - constitute two of the most important links in the chain of circumstance that culminated in the establishment of the original thirteen American Colonies as a free and independent nation. Doctor Franklin's philosophic attainments are well attested in Poor Richard's Almanac, published by him for many years under the name of Richard Saunders. His interest in the cause of Freemasonry is also shown by his republication of Anderson's Constitutions of Freemasonry, a rare and much disputed work on the subject. It was during the evening of July 4, 1776, that the second of these mysterious episodes occurred. In the old State House in Philadelphia a group of men were gathered for the momentous task of severing the last tie between the old country and the new. It was a grave moment and not a few of those present feared that their lives would be the forfeit for their audacity. In the midst of the debate a fierce voice rang out. The debaters stopped and turned to look upon the stranger. Who was this man who had suddenly appeared in their midst and transfixed them with his oratory? They had never seen him before, none knew when he had entered, but his tall form and pale face filled them with awe. His voice ringing with a holy zeal, the stranger stirred them to their very souls. His closing words rang through the building: "God has given America to be free!" As the stranger sank into a chair exhausted, a wild enthusiasm burst forth. Name after name was placed upon the parchment: the Declaration of Independence was signed. But where was the man who had precipitated the accomplishment of this immortal task - who had lifted for a moment the veil from the eyes of the assemblage and revealed to them a part at least of the great purpose for which the new nation was conceived? He had disappeared, nor was he ever seen again or his identity established. This episode parallels others of a similar kind recorded by ancient historians attendant upon the founding of every new nation. Are they coincidences, or do they demonstrate that the divine wisdom of the ancient Mysteries still is present in the world, serving mankind as it did of old? Ascension Research Center is run and maintained by students of the Ascended Masters, and is not sponsored by any organization. It is independent of The Theosophical Society, Agni Yoga Society, I AM Religious Activity of the Saint Germain Foundation, ADK Luk Publications, Ascended Masters Teaching Foundation, The Summit Lighthouse, Church Universal and Triumphant, or The Temple of The Presence.